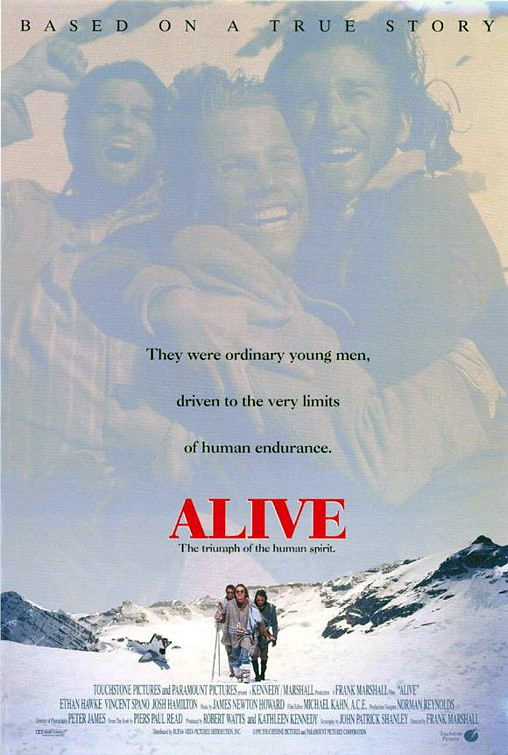 Ethan Hawke, Vincent Spano and Josh Hamilton star in this real-life drama -- infamous for an incident of cannibalism -- based on the book by Piers Paul Read. The story follows a South American Rugby team after their plane crashes in the Andes Mountains. VIOLENCE/GORE 7 - No violence of the regular action movie type -- that is, no fighting or shooting. However, the plane crash results in various unpleasant scenes of gore. One man's leg is slit open, a steel rod goes through the stomach of another man. Limbs are shown in a state of decay from gangrene. The pilot's head is shown against the cockpit window, which is smeared with blood. There are glimpses of people sawing hunks off dead bodies: both the dismemberment and consumption of dead bodies is lingered over by the camera. There's nothing tasteful about cannibalism, so a lot of flinching is unavoidable. LANGUAGE 6 - Several F-words, and some lesser stuff. DISCUSSION TOPICS - Cannibalism and the moral issues associated with it. MESSAGE - The human spirit is capable of achieving the near-impossible. The end does justify the means when survival is at stake.